“The Lord is with you ”. 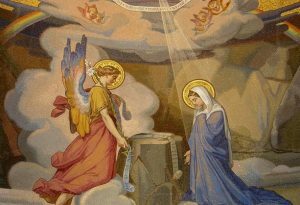 God, the ALL-Present, meets Mary, greets her, reveals her profound identity: “Full of God – the Beloved” and awaits an answer, God waits for Mary to choose to turn her heart or to the views of God , or towards her views. Waits for her to choose herself as the criterion of discernment or trust the words of God. And Mary chooses: “let it be done to me according to your word”! Every moment is a moment of choice, of response; every moment is a moment of calling that asks us to choose God or ourselves. By choosing God, Mary adheres to the most profound truth of her being: she feels herself as a ‘servant’ and as such presents herself, free and unpretentious, before her Lord.